Passover is a holiday often shared by families and friends. If you're cooking for, hosting and/or attending a Passover celebration, share your photos and we'll create a J album to share next week. Email your photos to jnet@thejkc.org. "I have had the opportunity to do many different and rewarding things over my career. Most recently, I was the Program Director for school-age children for the YMCA in Minnesota (I had a 3 month stint of insanity over winter in Minnesota) and Kansas City. Prior to that I was the Director of Faith-Based and Community Initiatives for the Department for Children and Families recruiting all over Kansas for foster families as well as managing a mentoring program for those trying to bridge out of poverty. Similar to my current position with The J, I was the Center Administrator for a wonderful pregnancy resource center for 7 years. I managed the day-to-day operations of two sites, helped with fundraising and basically did whatever needed to be done – something I sense will be needed here! No day was the same. I have been married to my husband, Robert for 26 years this month. We have 2 grown children. Our son Michael works in KC and daughter, Madison is a first year med student in Rochester, MN at the Mayo Clinic School of Medicine. I love to travel, especially to visit new breweries and wineries, sandy beaches or even new places I haven’t been before in Kansas City. I have a family of KU alums so we love our Jayhawks. Huge sport fan in general; love the Chiefs and will continue to pray this year for the Royals! I am thrilled to be here at The J. Everyone was been so welcoming. Please stop by and introduce yourself – maybe multiple times! And thank you ahead of time for showing GRACE. Why An Egg, Shank Bone and Bitter Herbs? Passover is the most commonly celebrated holiday in the Jewish calendar. Every year, friends and families all over the world gather to enjoy a ceremonial meal and retell its epic story. As a J Team member, you'll want to know the basics about this important Jewish holiday. 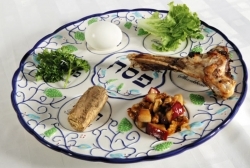 Click here for a quick overview, glossary and explanation about why the seder plate (pictured here) contains an egg, bitter herbs, shank bone, parsley, lettuce and charoses! Ice Cream Party Wednesday 1:00-2:00 pm! Stop by for a sweet treat (ice cream, cookies and brownies) and a chance to "build community" within our J Team family. A group of J employ ees, members and Board of Directors representatives participated in the Faith, Love & Walk yesterday to show support for the event sponsor, SevenDays. The walk represents us walking together as a society, embracing our diversity and uniting as a community. As the SevenDays website states, "We must gather as ripples of Faith, Love & Kindness and move ONWARD as an unstoppable wave of change." Thanks to everyone who made time to participate and represent the J at this important community event. Thanks to all of you for sharing your time and talent with The J and our members! Congratulations to Matt Multer, winner of our Hug Your Dog Day drawing. He wins a $25 PetSmart gift card. Thanks to everyone who submitted photos, which you can see here. If you hear this phrase at The J, it’s probably Friday. For a lot of people, Friday marks the last day of the regular work week. For Jews, it’s also the start of the sabbath, which starts at sundown on Friday and continues through sundown on Saturday. “Shabbat” is Hebrew for Sabbath and “Shalom” means peace. When you say “Shabbat Shalom,” you are wishing someone peace on the Sabbath. So is it OK to say “Shabbat Shalom” if you’re not Jewish or aren’t certain you’re speaking to a Jewish person? Yes! The J is a Jewish organization and it’s appropriate to use this phrase on Fridays with anyone you meet on Campus. Starting tomorrow, give it a try and say “Shabbot Shalom” to someone you meet at The J. If they know what it means, they’ll be pleased to receive the warm wishes. If they don’t know what it means, you can educate them as you wish them a peaceful day. Linda French is now ordering office supplies. (Thanks to Brian Woeppel for handling this responsibility prior to Linda’s start.) The supply order form is at Linda’s desk in the Admin office - right out side my office door. A big thanks to Linda for organizing the supply closet. She’s tackling the paper closet next, which will be nice for all of us. Thanks, Linda! "The J has everything you need to meet your fitness goals from weights, swimming, cardio equipment and more. The trainers are great and really motivate you to meet your goals. Everyone on staff is friendly and helpful. And with the added benefit of MyZone I can now track my own results and understand what I need to do to meet my goals. I am so glad we found The J." It's great to hear compliments- especially about a new service like MyZone. Good job, all! Mike Hicks, Manager of Meshugge Crossfit, got a nice surprise at a recent department meeting. He was presented with an Employer Support of Guard and Service (ESGR) Patriot's Award. Mike was nominated by SGT Brandon Koontz of the Army National Guard, one of our CrossFit coaches. The Patriot Award reflects the efforts made by individual supervisors to support citizen warriors through a wide-range of measures including flexible schedules, time off prior to and after deployment, caring for families, and granting leaves of absence if needed. Help us wish Mike a hearty Mazel Tov, and a big thank you to Brandon for his service and his thoughtfulness in nominating his supervisor. The J is proud to support our staff members who serve in the military. One of the ways The J participates in the SevenDays program is to highlight how we live out J Values, which connect with the SevenDays themes of love, connecting with others, taking care of mind, body, soul, etc. Our SevenDays display is in the theatre lobby and it needs your photos! Please take a look at the display and send corresponding photos to Lauren Levin. Make a Ripple. Change the World. Today starts the week of SevenDays activities. Please remember to wear your button from Tuesday April 9 -15. Here is the link to register for the walk http://givesevendays.org/walk/ AND please let Felicea@thejkc.org know if you are walking so you can walk as a group. If you've worked at The J for more than a year, you will see a familiar face back at the main Security desk this morning. Ben Brake just returned from 13 months of active duty, much of which was spent in the Middle East. Ben is a member of the Army Guard. We are glad to have you back home, Ben, and thank you for your service! Wednesday, April 10 is National Hug Your Dog Day. Did you know that hugging your dog releases a hormone in both the pup and the person called oxytocin, also known as "the cuddle hormone." Make sure to give your canine friends extra hugs this week - you'll both benefit. We want to see photos of your furry best friends. Send a photo of your dog (or cat, rabbit, hamster...whatever) to jnet@thejkc.org by Friday, April 12 at noon and you'll be entered to win a $25 PetSmart gift card. We'll share a slideshow of all photos submitted. Each summer we bring two Israeli staff members to Kansas City to work as Shlichot (Israeli Ambassadors) with J Camp. This summer they will be here from approximately May 27 through August 4. We are looking for Host Families. Would you be interested? Or do you know any families that might be interested? We need host families to provide meals, a place to sleep, and transportation to and from The Jewish Community Center. Their Day Camp work schedule is roughly 8:15 a.m. - 4:15 p.m. Monday through Friday. Families can choose to host for 2 or 3 weeks at a time. Noam Tzarfaty (left) is from Hertzliya, near Tel Aviv. She is 20 years old and has finished her Army Service, and is still working as a Commander in Air Force Intelligence until the end of May. Noam eats Kosher style, but she is not strictly Kosher and does not require separate Kosher dishes. She enjoys working with children and will be working as J Camp’s Israeli Culture Specialist this summer. Michal Alhindi (right) is from Nes Ziyyona, which is south of Tel Aviv. She is 20 years old and has finished her Army Service. Michal eats Kosher style, but is not strictly Kosher and does not require separate Kosher dishes. She likes art, plays the piano, and sang in a youth band for five years. 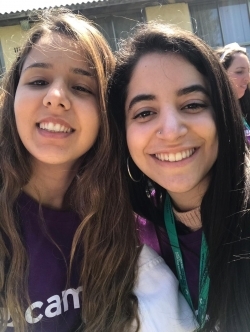 She has been a counselor in a day camp in Israel and will be a Barney Goodman Counselor this summer. Let me know if you have questions. And please let me know if you are interested in hosting one of our Shlichot this summer, or if you know of anyone who might be interested. 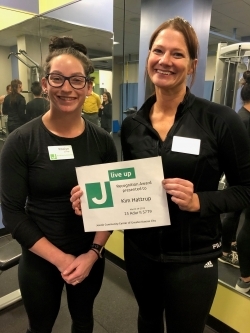 Congratulations to Kim Hattrup, Personal Trainer, for receiving a Live Up award. Kim was nominated by a coworker for showing extraordinary patience and kindness to a client who was struggling with multiple issues. Thanks to Kim for living J Values. To nominate a coworker for a Live Up award, click "Live Up Nomination" at the top of this page or visit www.thejkc.org/liveup. Pictured are Roslyn Zuniga, Manager of Personal Training, and Kim Hattrup. Brian Woeppel, Receptionist, wrote this personal story in response to our focus on the J Value of "Enhancing Mind + Body + Soul." Thank you for sharing your story, Brian! We're glad you're part of the J family! "In the fall of 2017, I had a knee replacement done. I thought it would make life better and easier, but it didn’t. The surgery was a success, but I was just not ready to make the changes I had to make in my lifestyle to gain the benefits I was hoping for. So in January 2018, badly overweight and unhealthy, I moved to Kansas City with hopes of a better life. I had to make the decision to actively pursue the life I wanted, not just hope it would happen. I was taking meds for high blood pressure, high cholesterol, gout, and fluid retention. And because of a stroke I had almost 8 years ago, and subsequent trauma surgery and open-heart surgery, I have a permanent partial loss of some equilibrium. So for anything to change, I had to change the way I lived life, from my eating habits to my attitude. My goals were losing weight, getting stronger, getting off prescription drugs, learning to choose happiness in life, and rediscovering my relationship with God." Congratulations to Stacey Belzer, Director of Family Engagement, for receiving a Live Up award. Stacey was nominated by a coworker for jumping in to help on an unexpected Vacation Day (lots of kids, not enough staff). Stacey saw another department in need and proactively took action and gave hands-on help. Thanks to Stacey for living J Values. To nominate a coworker for a Live Up award, click "Live Up Nomination" at the top of this page or visit www.thejkc.org/liveup. Pictured are Gayle Levin, COO, and Stacey Belzer. Congratu lations to Rachel Bolter, Administrative Assistant for Camp + School-Age Services. She won the random drawing for a $25 grocery store gift card. We assume she'll stock up on her favorite version of PB&J - crunch peanut butter with cherry preserves on waffles! "FUNatics is an instructional sports program that gets kids involved in sports activities at a young age. Instructional sports programs are the foundation for kids to learn sports, but participants are also developing their gross motor skills and social skills in these programs. 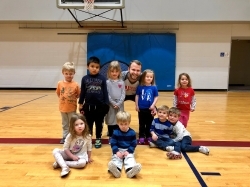 The J’s FUNatic sports program offers t-ball, karate, basketball, tennis and soccer classes year-round for kids in the CDC and the general community. Although I am currently offering classes mainly to the CDC, I am looking to partner with other preschools in the surrounding area to offer similar programs." If you have ideas for other preschools that might want FUNatics, let Will know. And say hello to Will and his companions when you see them around The J. "We go to The J nearly every weekday and love it! My husband works out in the gym and I attend Cardio Fitness through the Heritage Center. The J is a friendly place where we are happy and comfortable. I also play cards and Mahjong at The J regularly. The Theater offers many wonderful plays and musicals that are professionally done! I can't imagine retirement without our connection to The J!" It's great to hear compliments about so many J areas - Fitness + Sports, Arts + Culture and Heritage Center. Great job. everyone! Today is National Peanut Butter & Jelly Day! To celebrate this iconic concoction, tells us (in the Comments section) what makes a perfect PB&J for you...white or wheat? Crunchy or smooth? Grape or Strawberry? Triangles or Rectangles? We'll draw a winner at 5:00 pm on Wednesday, April 3. Free Tickets to "Chita & Friends"
Our friends at Johnson County Community College have offered The J free tickets to "Chita & Friends" - a unique concert event. If you love classic Broadway tunes from West Side Story; Sweet Charity; Chicago; Kiss of the Spider Woman; Bye, Bye, Birdie; The Rink; The Visit, you'll love this opportunity to be "up close and personal" with Chita Rivera, a talented trio of musicians and two talented vocalists who are Broadway stars in their own right. To request your free tickets, email or contact Felice Azorsky by 5:00 pm Wednesday, April 3rd. To learn more about the show, visit the Carlsen Center website. Congratulations to Whitney Huskey, Floating Teacher in the CDC, for receiving a Live Up award. Whitney was nominated by a coworker for going above and beyond in demonstrating J Values. Whitney helps to build community through many small gestures . She demonstrates kindness and gives thoughtful, personalized support to her coworkers. Thanks to Whitney for living J Values . To nominate a coworker for a Live Up award, click "Live Up Nomination" at the top of this page or visit www.thejkc.org/liveup. Pictured are Machaela Whalen (Director, CDC) and Whitney Huskey. Congratulations to Deb Brown, Manager of Heritage Center Programs, for receiving a Live Up award. Deb was nominated by a coworker for going above and beyond in demonstrating J Values. On a recent snowy and icy day, Deb escorted a Heritage Center member to her car and scraped her windshield to ensure she stayed safe. Deb knew the member had recently had several falls and suffered a fracture. Thanks to Deb for her kindness and helpfulness. To nominate a coworker for a Live Up award, click "Live Up Nomination" at the top of this page or visit www.thejkc.org/liveup. Pictured are Deb Brown (left) and her supervisor, Sandra Greason. 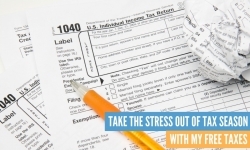 Tax filing season is officially here, but that’s no reason to stress out. United Way of Greater Kansas City is once again offering MyFreeTaxes.com, a free tax e-filing system for households that made $66,000 or less in 2018. This IRS-certified and secure service is powered by H&R Block, and offers free filing for federal and up to three state returns. Best of all, it’s easy (and free). That means less stress and more money in your pocket! "I like being greeted by friendly and smiling people working the front entry area. For me, it’s all about first impressions. A smile and a positive greeting go a long way." Thanks, Member Experience Desk staff, for providing a warm welcome to our Members and guests! “Once upon a time” and the “happily ever after” of the box office. Liz greets customers & J members, helping them with ticket transactions and donations during the day. She is also present on performance days to welcome guests and complete any walk up transactions. She keeps the cast fed during tech week, assists our Director of Arts + Culture (Keith) with various administrative duties, and constructs the playbills for each show (with the help of our marvelous marketing team). Her daughter Lucy can also occasionally be found running Will Call for patrons. Perhaps a future thespian and J employee in the making!